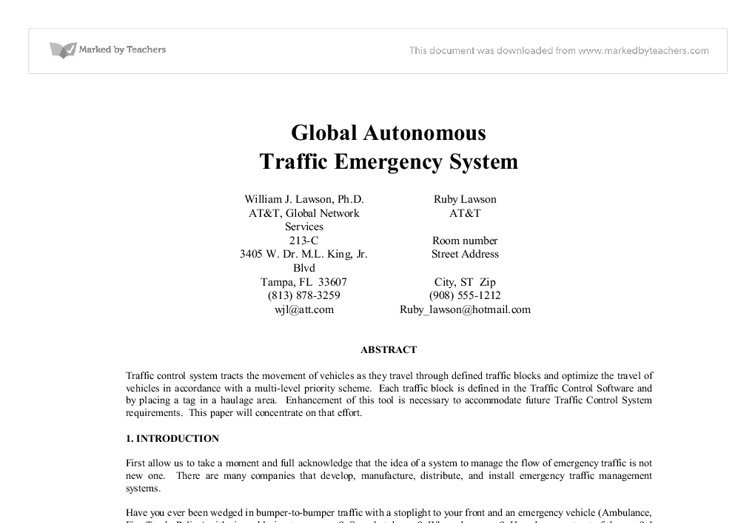 Global Autonomous Traffic Emergency System William J. Lawson, Ph.D. Ruby Lawson AT&T, Global Network Services AT&T 213-C Room number 3405 W. Dr. M.L. King, Jr. Blvd Street Address Tampa, FL 33607 City, ST Zip (813) 878-3259 (908) 555-1212 wjl@att.com Ruby_lawson@hotmail.com ABSTRACT Traffic control system tracts the movement of vehicles as they travel through defined traffic blocks and optimize the travel of vehicles in accordance with a multi-level priority scheme. Each traffic block is defined in the Traffic Control Software and by placing a tag in a haulage area. 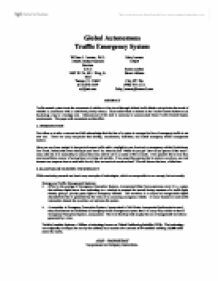 Enhancement of this tool is necessary to accommodate future Traffic Control System requirements. This paper will concentrate on that effort. 1. INTRODUCTION First allow us to take a moment and full acknowledge that the idea of a system to manage the flow of emergency traffic is not new one. There are many companies that develop, manufacture, distribute, and install emergency traffic management systems. Have you ever been wedged in bumper-to-bumper traffic with a stoplight to your front and an emergency vehicle (Ambulance, Fire Truck, Police) with sirens blaring to your rear? So, what do you? Where do you go? ...read more. > GOOD - Any of the existing traffic management systems are not costly to implement, because each systems stands alone. That is to say that all of the equipment is located at the traffic light and is not reliant upon another system. This also means that a community has the flexibility of buying one system or 100. Which is extremely beneficial for small community and cost effective. > BAD - Ironically, what is beneficial for a small community is bad for large community. Why? The fact that each unit stands alone is a drain on maintenance and would be costly for a large community. > UGLY - The system is not adaptive and does not take into account traffic flow. Now let us take a moment to examine the vehicle locating systems, you will notice that they employ GPS technology. A GPS system is excellent for tracking a vehicle, but it is not employed in any emergency traffic management system that we could find. 4. OUR CONCEPT We can do better!!! Our concept is to create an Global Autonomous Traffic Emergency System (GATES) that will seize the benefits of GPS and 1.1 Second Level Header Second-level headers are Initial Caps Only. ...read more. on bottom footer: u 1 inch from bottom alignment: u Title, footer (proprietary marking), author information, "ABSTRACT" heading, and "References" heading are centered. u First-, second-, and third-level headings are left justified. u Abstract text and paper text are justified (both left and right margins). font type, size & style: u Title: Times 20 point Bold (title line spacing before: 1 point and after: 1 point) u author information, abstract text, paper text, and footer: Times 10 point u FIRST LEVEL HEADER: Times 9 point Bold (ALL-CAPS) u Second Level Header: Times 8 (Initial Caps) u Third Level Header: Times 9 Italic (Initial Caps) spacing: u Two empty lines before and after the ABSTRACT heading. u Two empty lines after the abstract text. u Three empty lines before the References heading. u One empty line before the footer text (proprietary marking). author information: u The form used for author entry differs with the number of authors. For one author, center the name and contact info. For 2-3 authors, substitute the author information in the table provided. For 4 or more authors, provide contact info for only one author, and list the authors' names in a comma-separated list. Delete the forms that you do not use. ...read more. However, running two systems simultaneously can put a tremendous strain on the business in terms of time, money and manpower. In a pilot conversion, the new system is implemented in one location or segment of the business before its full implementation throughout the organisation. www.google.com GOOGLE * www.yahoo.com YAHOO * www.lycos.com LYCOS Many search websites have a server that runs in the UK as well as the in USA and other countries. If you are looking for flights from the UK to Europe, then it is best to search on www.google.co.uk. The person inputting would be much happier than writing on paper. This will have fewer errors, making it convenient. The data will be entered in directly by keyboard. The person can choose from a list of orders to restrict any errors. After, from your desktop go to 'My Computer'. Once the explorer has opened you should see that your CD or DVD drive should read 'Installation CD'. 2. Now double click on the CD or DVD drive ('Installation CD'), and this should lead you to the contents of the disc. 3. Normal data and unit testing. Enter 02084256897 in member ID 22 telephone field. The telephone number of the member should be successfully changed in Member ID 22 details. Pass. None needed. 17 Price update query for cars macro. Normal data and integration testing. Click on the 'Update Cars Prices' button in the Functionalities form. This is a responsibility of the hotel receptionist. * Requires qualifications of the employees- this would inform the employee about the qualifications needed in order to have the job and do the work successfully. * Position title- this tells the employee about what they may be regarded as and tells them the position that they are applying for.